Black and white poster has text at top that reads, "National Conference for a United Front Against Fascism." A photograph is printed below of a man that appears to have been hit on the head. He is outdoors on a grassy field being escorted by two police officers. A crowd of people and reporters appear in the background. 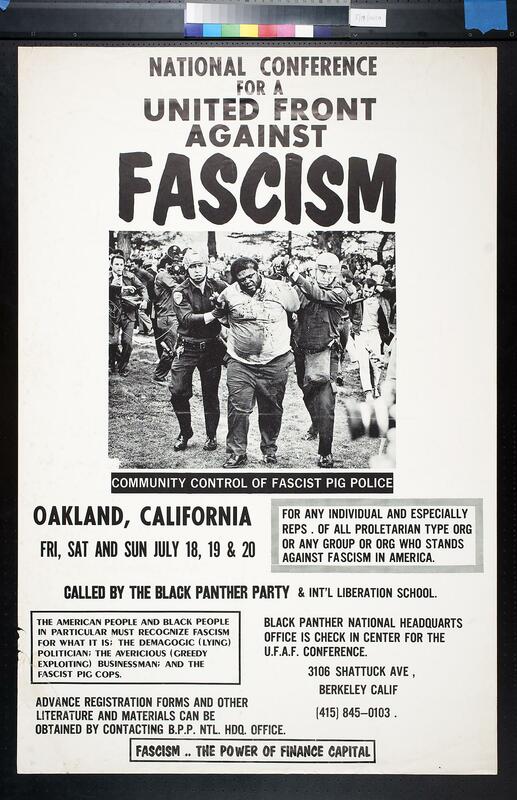 The photo caption reads, "Community Control of Fascist Pig Police." 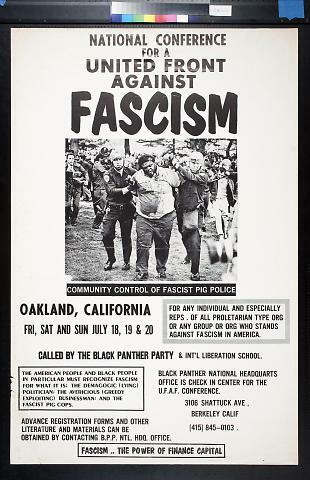 The lower third of the page contains text that notes the conference is called by the Black Panther Party and the International Liberation School in Oakland, California on the weekend of July 18-20. The address for the Black Panther National Headquarters is listed as well as text on the topic of fascism. "Fascism .. The Power of Finance Capital" is printed at bottom center.